Would like to thank the folks at Cable Chick for their service. The items I purchased were the best price by far, with the postage added on to boot. I was also amazed by the speed of their delivery, I live in Tasmania, and I received the items within 72 hours of putting them in my shopping cart!! I am sure this is a record for item delivery from any company I have dealt with. I will certainly be doing my business with them in the future. A springy cable to keep you tangle-free! Premium Avencore USB 2.0 Coiled Cable Type A Male to Male suitable for connecting all types of USB accessories and devices on PC, Mac, Linux, SmartTV and more. Coiled Cables are the perfect travel companion - they don't tangle easily, they pack up in no time, and they always look neat and tidy. Throw one in your laptop bag or grab a selection for your charge station at home and let the cables keep themselves in order. Our Premium quality Avencore Coiled Cables come in a matt-finish with a 12mm diameter curly part that reduces a metre and a half of cable into a 25cm length. It can safely stretch up to 100cm and still return to form (but at this length your devices may have trouble holding onto the plugs!). Suitable for all standard USB cable duties, including data transfer, sync and charge. 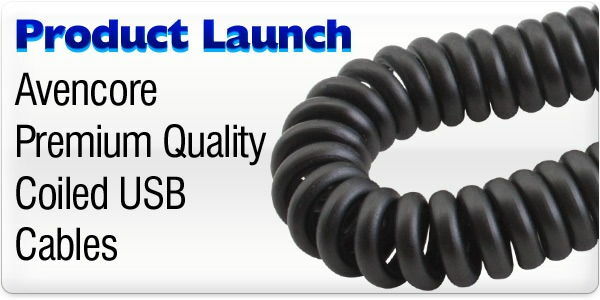 Don't forget to check out our other coiled cables! Please note: Over-stretching this cable may permanently compromise the integrity of the coiled section, and in extreme cases may damage the internal copper wiring. Just thought I would drop you a line to say how pleased I am with my latest purchase. When I mentioned to my 16 year old Grandson (I'm 69 and need some guidance re computers) that I needed a USB extension lead, he informed me that anything over 2m was a waste of money and wouldn't perform too well. As I've purchased HDMI Cables, etc, from you I decided to see what you had to offer. After studying the comprehensive Technical Specifications you provide with each cable, I decided for once to ignore his advice and purchased a 5m Premium USB 2.0 Hi-Speed Extension Cable from you. I am delighted with my purchase and the superfast delivery. The quality and speed of transfer of my files via this cable are a joy to behold and even my Grandson has admitted he was wrong... One up for the Wrinkles! 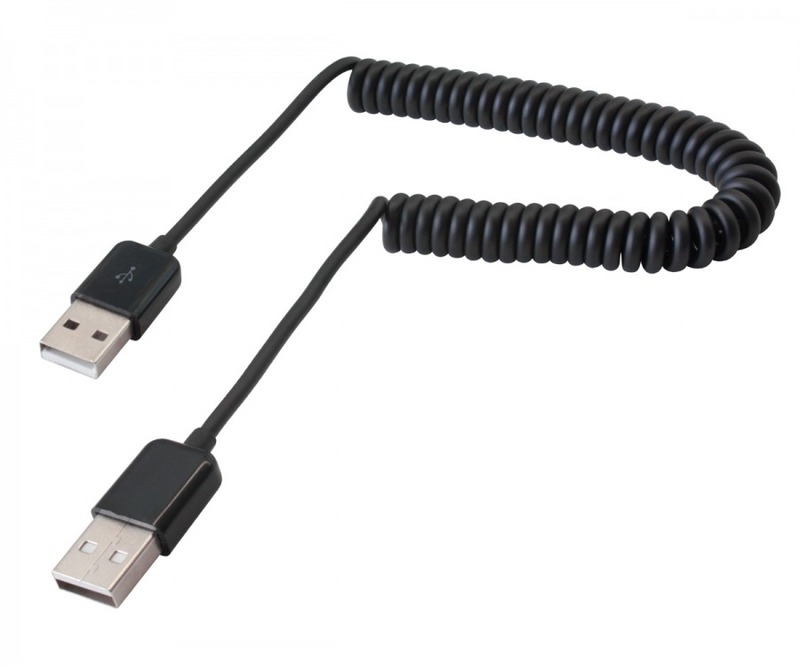 Premium matte-finish Type-A USB 2.0 Coiled Cable for use with any USB accessories and devices for data and/or charging. Compact coiled cable stretches between 50cm and 100cm.